WBO and IBA Light Heavyweight World Champion Sergey “Krusher” Kovalev of Russia makes a dual title defense against undefeated light heavyweight contender Eleider “Storm” Alvarez of Colombia at the Hard Rock Hotel & Casino in Atlantic City on Saturday, August 4. The fight card will be televised live on HBO World Championship Boxing beginning at 10:00 p.m. ET/PT. Strengths The Krusher has the heaviest hands in the light heavyweight division. He has the ability to end a fight with any punch he throws. He also has plenty of championship experience. This will be his 14th consecutive championship bout. Storm has very quick hands and possesses a sharp and accurate jab. He is an exceptional counter-puncher who shows great patience in the ring while waiting on his opponents to make a mistake. Weaknesses Kovalev tends to leave openings in his guard, which could be costly considering how effective of a counter-puncher his opponent is. Alvarez is an accurate puncher, but he does not possess the power his opponent does. Experience Kovalev’s experience has become one of this veteran’s biggest strengths. He has far more professional bouts under his belt than his opponent. He has been involved in nothing but title fights since 2013. Although he holds wins over former champions Jean Pascal and Lucian Bute, this will be the biggest bout of Alvarez’s career thus far. It will also be his first world title bout. Power Power is Kovalev’s number one weapon. There are bad intentions behind every punch he throws and one can end the fight in an instant. The challenger will be at a disadvantage. He is not known to be a power-puncher and has only recorded one stoppage win in his previous six bouts. Speed The champion has average speed, but he will not be able to match the quick hands of his opponent. Here, Alvarez will have an advantage with his quick hands and brisk combinations. Endurance Kovalev has gone a full 12-rounds just three times in his lengthy career. Similar to his opponent, Alvarez has been a full 12-rounds on just three occasions, including his wins over Isaac Chilemba and Jean Pascal. Accuracy Kovalev has a pinpoint accurate jab and throws rigorous power shots behind it. He is also a very effective body puncher, which has delivered early stoppages in the past. Accuracy is one of Alvarez’s biggest strengths. He patiently waits for his opponents to provide openings before unleashing a storm of shots on them. Defense Throughout his career, Kovalev’s aggressive offensive style has been his best defense. His power has forced prior opponents to re-think their game plans in hopes of making it to the final bell. Alvarez is a solid defensive fighter. He moves his head well and shows great composure while waiting for his opponents to make a mistake. Chin Kovalev has proven throughout his career that his chin is more than durable. Although he hasn’t faced a fighter with the power of Kovalev, so far Alvarez’s chin has proven to be strong. Style Kovalev has proven numerous times he has exceptional boxing skills. However, The Krusher prefers not to leave it in the hands of the judges. He wastes very little time in walking his opponents down and ending the night as early as possible. Alvarez is a counter-puncher with quick hands and a solid jab. He waits patiently for his opponents to make a mistake and capitalizes once they do. He has also shown he is not afraid to trade blows if that’s where the fight goes. Crowd Support The champion is expected to have significant crowd support. He has been the face of the light heavyweight division for many years. He has a fan-friendly style and knockout power to go with it. His win over Bernard Hopkins took place in Atlantic City. Although his one and only fight on American soil was back in 2015, Alvarez has a strong fan base in Canada. Plenty of fans are expected to cross the border to support the challenger with a trip to Atlantic City. Kovalev has taken on challenges from the best that the light heavyweight division has to offer since he became champion in 2013. The situation he finds himself in now is no different; he is taking on a challenger who has been patiently awaiting his title shot since 2015. His opponent on August 4 is hungry and has never tasted defeat, and he doesn’t plan on tasting it anytime soon. Alvarez has been the mandatory challenger for Adonis Stevenson’s WBC Light Heavyweight title since 2015. After years of the fight being discussed but never coming to fruition, the Quebec-based Colombian native jumped at the opportunity when offered a fight with titleholder Kovalev. He knows a win over Kovalev allows him to transform from challenger to champion and start his reign atop the 175 pound division. Will Alvarez be able to handle the Krusher’s power? Will Kovalev be able to handle counter punching and speed of Alvarez? Will Alvarez be able to handle the bright lights and fighting for a world title? 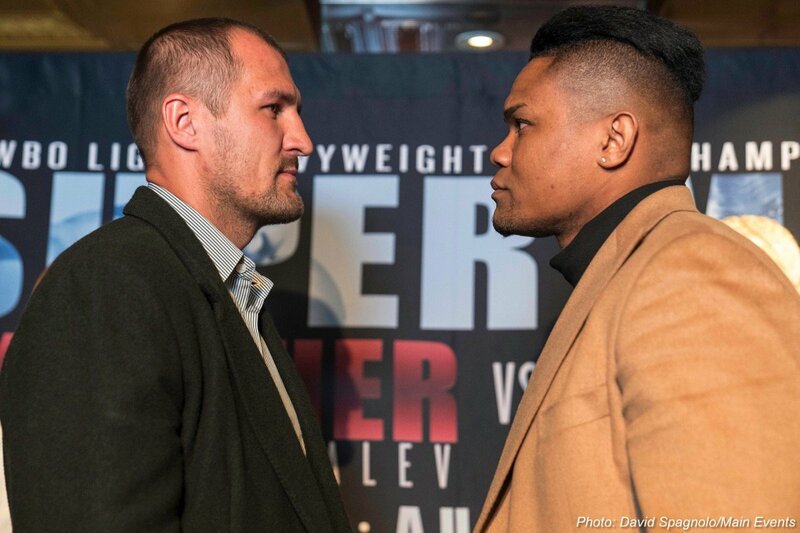 Will Kovalev rise to the occasion to prove he is the best Light Heavyweight out there?